Janet Kurnatowski is pleased to announce the exhibition “Year 5”, which showcases artists who have been associated with the gallery over the past five years. Please join us to celebrate the gallery’s ongoing dedication to abstraction. The opening reception is Friday, July 17th from 7-9pm. The show dates are July 17 – August 16, 2009. The gallery is located at 205 Norman Ave in Greenpoint, Brooklyn. Gallery summer hours are Saturday and Sunday 1-6pm. 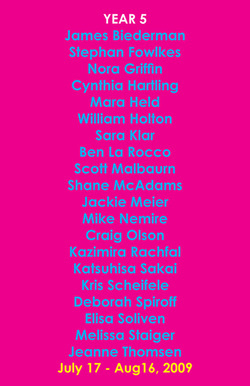 James Biederman, Stephan Fowlkes, Cynthia Hartling, Sara Klar, Ben La Rocco, Scott Malbaurn, Shane McAdams, Jackie Meier, Kazimira Rachfal, Katsuhisa Sakai, Deborah Spiroff, Melissa Staiger, and Jeanne Thomsen. Also currently showing: Mara Held, Nora Griffin, Mike Nemire, Craig Olson and Elisa Soliven. I’m pleased to introduce two new artists for the gallery: Kris Scheifele and William Holton.